Pulmonary hypertension is a significant complication in many paediatric disease states. This article discusses current understanding of pulmonary hypertension and includes definition, diagnosis, and management. A description of the latest advances in targeted pharmacological therapy in children is also provided as well as impact on morbidity and mortality. Pulmonary hypertension may be an idiopathic or primary phenomenon—that is, without an underlying cause, or secondary to a specific disease process. Idiopathic pulmonary arterial hypertension (IPAH) is a rare and poorly understood condition and is diagnosed by excluding conditions responsible for secondary pulmonary hypertension. Without appropriate treatment, the natural history of IPAH is progressive and fatal. In contrast, the natural history of pulmonary hypertension from congenital heart disease has a broad range of survival, ranging from months to decades. The selection of appropriate therapies is complex, requiring familiarity with the disease process, complicated delivery systems, dosing regimens, medication side effects, and complications. This article will discuss current diagnosis and treatment of children with primary and secondary pulmonary hypertension. Pulmonary hypertension is defined as a mean pulmonary artery pressure greater than 25 mm Hg at rest, or greater than 30 mm Hg during exercise.4 In 1998 the World Health Organisation proposed a new classification of pulmonary hypertension and this was updated in 2003 (box 1). This classification is appropriate to both the paediatric and adult age group. As the most successful strategy in the treatment of pulmonary hypertension is to treat the underlying cause, the workup of pulmonary hypertension involves a complete history and examination (box 2) and extensive evaluation (box 3), aiming to exclude all known aetiologies of pulmonary hypertension (box 1). Idiopathic pulmonary arterial hypertension is defined as a diagnosis of exclusion.3 The history and physical examination should be undertaken with attention to aetiology (boxes 1 and 2). Symptoms may include exertional dyspnoea, reducing exercise tolerance, orthopnoea, atypical chest pain, and haemoptysis. Syncope in this condition is a worrying sign of end stage disease. Non-invasive diagnostic studies are important in the evaluation of pulmonary hypertension (box 3). Cardiac catheterisation is important to evaluate pulmonary artery pressure and resistance as well as to determine reactivity of the pulmonary vasculature. Further, as respiratory disease is an important cause of pulmonary hypertension, extensive evaluation of the lung should be undertaken (box 3). A variety of congenital cardiac lesions cause pulmonary hypertension (box 4). The age at which these lesions cause irreversible pulmonary vascular disease varies. In general, patients with ventricular septal defect or patent ductus arteriosus do not develop irreversible pulmonary vascular changes before 1 year of age. Children with Down’s syndrome may have an increased risk of pulmonary hypertension. Furthermore, infants with an atrial septal defect or ventricular septal defect with chronic lung disease have an increased risk for the early development of severe pulmonary vascular disease. Patients with atrioventricular septal defect may develop irreversible pulmonary vascular disease earlier than patients with other left-to-right shunt lesions. Patients with cyanotic congenital cardiac lesions may also develop pulmonary hypertension. Hypoxaemia with increased shunting is a potent stimulus for the rapid development of pulmonary vascular disease. Examples include transposition of the great arteries, truncus arteriosus, and univentricular heart with high flow. Total correction of many cardiac lesions in the first months of life may prevent the late development of pulmonary hypertension. Finally, palliative shunting operations for certain cardiac anomalies designed to increase pulmonary blood flow may lead to the development of pulmonary hypertension. Eisenmenger syndrome describes pulmonary hypertension with a reversed central shunt.5 In general, the term “Eisenmenger syndrome” is used for shunts distal to the tricuspid valve. Increased pulmonary vascular resistance, and bidirectional or right-to-left shunting through a systemic-to-pulmonary connection, such as a ventricular septal defect, patent ductus arteriosus, univentricular heart, or aortopulmonary window characterises this syndrome. The shunt is initially left-to-right, but as the underlying condition continues to increase pulmonary vascular resistance, there is a reversal of the shunt, leading to cyanosis, and erythrocytosis. In general, the prognosis of patients with Eisenmenger syndrome is much better than for patients with idiopathic pulmonary arterial hypertension. Syncope, right heart failure, and severe hypoxemia have been associated with a poor prognosis. Phlebotomy may be utilised in Eisenmenger syndrome and should be reserved for temporary relief of major hyperviscosity symptoms or to improve perioperative haemostasis. Non-cardiac operations on Eisenmenger patients are associated with a high mortality rate, and should be managed by a multidisciplinary team experienced in the care of patients with pulmonary hypertension. Primary or idiopathic pulmonary arterial hypertension is a rare disease, which occurs most frequently in young adult females.6 Idiopathic pulmonary arterial hypertension is characterised by progressive and sustained increases of pulmonary artery pressure without a defined aetiology. Lung disease is an important factor in the aetiology of pulmonary hypertension in some patients. Resulting complications include pulmonary vasoconstriction or thromboembolic changes, which increase pulmonary pressure and lead to right ventricular hypertrophy and possibly right sided heart failure. Right ventricular function is usually normal until the disease progresses in severity. In most cases, the reversal of the hypoxic state leads to reversal of pulmonary hypertension. However, the development of cor pulmonale carries a poor prognosis. Treatment of cor pulmonale depends on the exact aetiology of the lung disease, as well as disease severity. Night time oxygen administration may alleviate hypoxia without hypercapnia. In patients with cystic fibrosis, calcium channel blockers have not shown proven effectiveness and may worsen oxygenation.10,11 For patients with end stage lung disease from cystic fibrosis, lung transplantation is an option. Disorders of respiratory mechanics may also lead to hypoxia, and the development of pulmonary hypertension. Thromboembolic disease as a cause of pulmonary hypertension in children is uncommon. However, an accurate diagnosis is essential for treatment.12 Predisposing factors include collagen vascular disease, hypercoagulation disorders (see box 1), bacterial endocarditis, as well as a right atrial shunt (cerebral ventricular) for hydrocephalus. Likewise, the use of oral contraceptive agents may cause hypercoagulation leading to pulmonary thromboembolic phenomena. Diagnosis involves a high index of suspicion, as well as evaluation by ventilation perfusion scanning and CT scanning. In adults with chronic thromboembolic pulmonary hypertension, pulmonary thromboendarterectomy has been shown to improve survival and quality of life. Most children with mild pulmonary hypertension do not require treatment other than treating the underlying aetiology. Therefore, a complete evaluation for the causes of pulmonary hypertension is important. Other general principles include avoidance of pregnancy and avoiding the use of birth control pills. Despite appropriate surgical correction, pulmonary hypertension and pulmonary vascular disease may progress. As vasoconstriction is an important component in the development of medial hypertrophy, vasodilators are frequently used to decrease pulmonary artery pressure, improve cardiac output, and potentially reverse some of the pulmonary vascular changes noted in the lung. Figure 1 shows our long term strategy for the treatment of pulmonary hypertension. Children who respond acutely to vasodilator testing with nitric oxide or epoprostenol should initially be treated with calcium channel blockers, such as nifedipine or diltiazem. Children who do not respond to acute vasoreactivity testing should be treated with other forms of therapy. Right heart failure (RHF) in the presence of a non-reactive pulmonary vasculature mandates treatment with continuous intravenous epoprostenol. In the absence of RHF, other agents may be trialled first. Bosentan, treprostinil, and iloprost have been studied and approved for treatment of pulmonary arterial hypertension. Other investigational drugs, such as sildenafil or sitaxsentan, are being assessed. For patients with severe disease, combination therapy may be considered but has not been well studied. 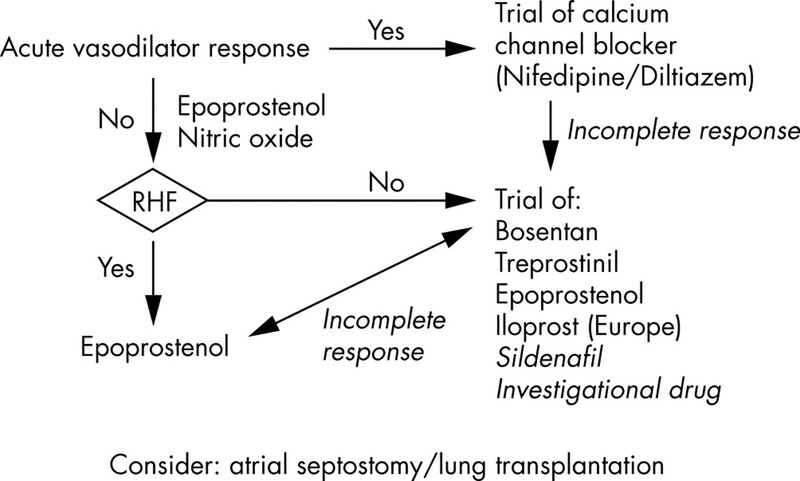 Algorithm of the treatment of paediatric pulmonary arterial hypertension. Inhaled nitric oxide (iNO) bypasses the damaged endothelium seen in pulmonary hypertensive disorders. The use of calcium channel blockers to evaluate vasoreactivity may be problematic as these drugs can cause a decrease in cardiac output. In addition, such deleterious effects may be prolonged due to the relatively long half life of calcium channel blockers. Consequently, increased right atrial pressure and low cardiac output are contraindications to acute or chronic calcium channel blockade. Our preference is to perform an acute trial of calcium channel blocker therapy only in those patients who are responsive to nitric oxide or prostacyclin. Likewise, patients who do not have an acute vasodilatory response to short acting agents and who are then placed on calcium channel blocker therapy are unlikely to benefit from this form of therapy.16 At least 60% of children with severe pulmonary hypertension are non-responsive to acute vasodilator testing, and are candidates for other forms of therapy, but not calcium channel antagonists. Kaplan-Meier curves of long term prostacyclin treatment in children with pulmonary hypertension at The Children’s Hospital Heart Institute/Paediatric Heart Lung Center, Denver, Colorado. PPH, primary pulmonary hypertension; CHD, congenital heart disease; CLD, chronic lung disease; Liver, liver disease; CTD, connective tissue disease. The use of prostacyclin in patients with congenital heart disease is promising.33 Disadvantages of prostacyclin analogues, such as epoprostenol, include the dose dependent side effects of the drug (nausea, anorexia, jaw pain, diarrhoea, musculoskeletal aches and pains) and side effects due to the method of delivery. The drug must be given through a central line and thus potential complications include clotting, haemorrhage, cellulitis, and sepsis. Furthermore, the delivery of the product to the patient is continuous with abrupt cessation causing acute deterioration and in some cases death. In patients with residual shunting, continuous prostacylin may result in worsening cyanosis and complications of cerebrovascular accidents. Success of epoprostenol (a synthetic analogue of natural prostacyclin) therapy, coupled with limitations of its delivery has led to the utilisation of prostacyclin analogues with alternative delivery routes. Endothelin-1 (ET-1) is a potent vasoactive peptide produced primarily in the vascular endothelial cell, but also may be produced by smooth muscle cells. Selective ETA receptor blockade is also possible using sitaxsentan, an ET receptor antagonist with high oral bioavailability, a long duration of action, and high specificity for the ETA receptor. Sitaxsentan may benefit patients with pulmonary arterial hypertension by blocking the vasoconstrictor effects of ETA receptors while maintaining the vasodilator/clearance functions of ETB receptors. Sitaxsentan given orally for 12 weeks was seen to have beneficial effects on exercise capacity and cardiopulmonary haemodynamics in patients with pulmonary arterial hypertension that was idiopathic, or related to connective tissue disease or congenital heart disease.41 Further studies using selective ETA receptor blockade in postoperative congenital heart disease42,43 have been reported. Specific phosphodiesterase-5 inhibitors, such as sildenafil, also have a role in treatment of pulmonary hypertension. 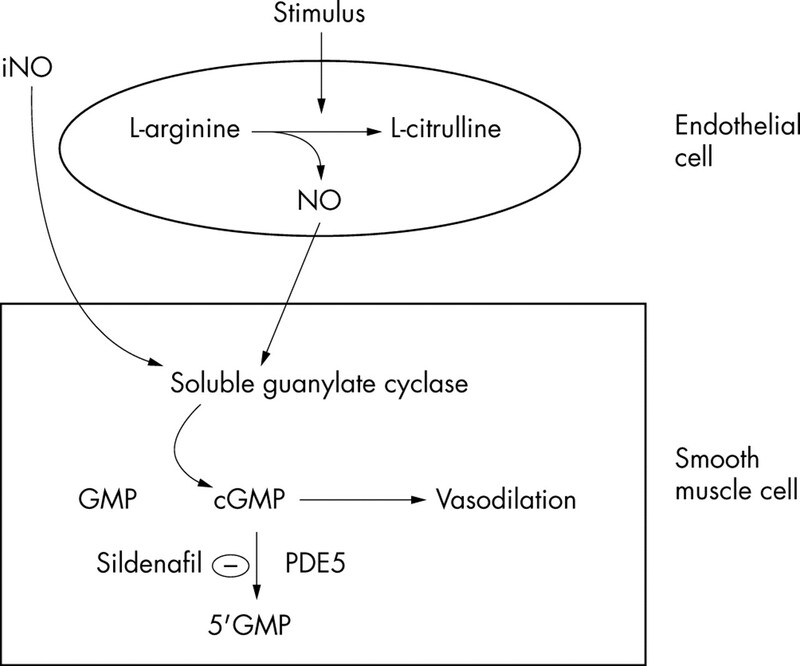 These drugs promote an increase in cGMP levels and thus cause pulmonary vasodilatation (fig 2). Sildenafil is as effective a pulmonary vasodilator as inhaled NO and may be preferred because it does not increase pulmonary wedge pressure.3,45 Sildenafil may also be useful in the setting of inhaled nitric oxide therapy withdrawal,30 in postoperative pulmonary hypertension,46,47 or in the presence of pulmonary hypertension related to chronic lung disease.48 In some settings, sildenafil may worsen oxygenation.46 Studies examining the use of such oral phosphodiesterase-5 inhibitors over the long term are ongoing. Anticoagulation may be required because some causes of pulmonary hypertension may be associated with low cardiac output leading to sluggish blood flow through the pulmonary artery which may predispose to the development of pulmonary thrombi. In adults with IPAH, use of warfarin improves survival. However, the use of chronic anticoagulation has not been studied widely in children, but is usually recommended. The use of anticoagulation agents in patients with Eisenmenger syndrome is controversial. In primary pulmonary hypertension the aim is to keep the INR at 1.5–2.0. Risks of anticoagulation in other forms of pulmonary hypertension must be weighed against advantages. The general indications for atrial septostomy include pulmonary hypertension refractory to chronic vasodilator treatment49 and in symptomatic low cardiac output states. Syncope and intractable right heart failure are indications for patients who are treated with vasodilators and remain refractory. Risks associated with this procedure include a worsening of hypoxaemia with resultant right ventricular ischaemia and worsening right ventricular failure, increased left atrial pressure, and pulmonary oedema. For patients who do not respond to prolonged vasodilator treatment, or with certain lesions, such as pulmonary vein stenosis, lung transplantation may be offered.50–52 Cystic fibrosis accounts for the majority of lung transplants, with primary pulmonary hypertension as an indication for transplantation in 14–17% of patients. For certain patients, including those with congenital heart disease, heart-lung transplantation may be necessary. Advances in the understanding of the pulmonary vasculature have led to improved survival in children with severe pulmonary hypertension. The timely diagnosis of paediatric pulmonary hypertension is of paramount importance because treatment strategies improve morbidity and mortality. An extensive evaluation is performed in children with severe pulmonary hypertension, as the most successful strategy involves treatment of any underlying disorders. Further, a targeted approach to treatment includes acute vasodilator testing at cardiac catheterisation to determine long term therapy. In patients reactive to acute vasodilator testing with short acting vasodilators, such as inhaled nitric oxide, calcium channel blockers have been shown to provide effective therapy. In those patients not reactive to acute vasodilator testing, one should consider other forms of therapy, such as epoprostenol. Newer treatment strategies in children include the use of endothelin receptor antagonists, inhaled nitric oxide, prostacylin analogues, and phosphodiesterase inhibitors. Recent advances have given the clinician more options in the management of a once uniformly fatal condition; however, more work is required to understand the role of new treatments for children with pulmonary hypertension in different clinical settings. Thilenius OG, Nadas AS, Jockin H. Primary pulmonary vascular obstruction in children. Pediatrics1965;36:75–87. Sandoval J , Bauerle O, Gomez A, et al. Primary pulmonary hypertension in children: clinical characterization and survival. J Am Coll Cardiol1995;25:466–74. Barst RJ. Recent advances in the treatment of pediatric pulmonary artery hypertension. Pediatr Clin North Am1999;46:331–45. Rich S, ed. Primary pulmonary hypertension. Executive summary from the world symposium. Primary pulmonary hypertension World Health Organisation, 1998. Widlitz A , Barst RJ. Pulmonary arterial hypertension in children. Eur Respir J2003;21:155–76. Newman JH, Wheeler L, Lane KB, et al. Mutation in the gene for bone morphogenetic protein receptor II as a cause of primary pulmonary hypertension in a large kindred. N Engl J Med2001;345:319–24. Trembath RC, Harrison R. Insights into the genetic and molecular basis of primary pulmonary hypertension. Pediatr Res2003;53:883–8. JE, Loyd MB, Foroud TM. Genetic anticipation and abnormal gender ratio at birth in familial primary pulmonary hypertension. Am J Respir Crit Care Med1995;152:93–7. Davidson A , Bossuyt A, Dab I. Acute effects of oxygen, nifedipine, and diltiazem in patients with cystic fibrosis and mild pulmonary hypertension. Pediatr Pulmonol1989;6:53–9. Geggel RL, Dozor AJ, Fyler DC, et al. Effect of vasodilators at rest and during exercise in young adults with cystic fibrosis and chronic cor pulmonale. Am Rev Respir Dis1985;131:531–6. Auger WR, Channick RN, Kerr KM, et al. Evaluation of patients with suspected chronic thromboembolic pulmonary hypertension. Semin Thorac Cardiovasc Surg1999;11:179–90. Rabinovitch M . Pulmonary hypertension: pathophysiology as a basis for clinical decision making. J Heart Lung Transplant1999;18:1041–53. Balzer DT, Kort HW, Day RW, et al. Inhaled nitric oxide as a preoperative test (INOP test I): the INOP Test Study Group. Circulation2002;106:176–81. Rimensberger PC, Spahr-Schopfer I, Berner M, et al. 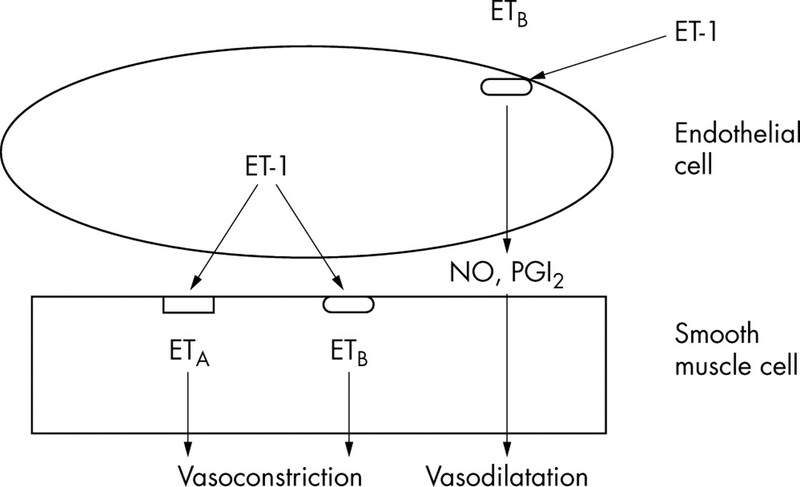 Inhaled nitric oxide versus aerosolized iloprost in secondary pulmonary hypertension in children with congenital heart disease: vasodilator capacity and cellular mechanisms. Circulation2001;103:544–8. Barst RJ, Maislin G, Fishman AP. Vasodilator therapy for primary pulmonary hypertension in children. Circulation1999;99:1197–208. Atz AM, Adatia I, Lock JE, et al. Combined effects of nitric oxide and oxygen during acute pulmonary vasodilator testing. J Am Coll Cardiol1999;33:813–19. Pepke-Zaba J , Higenbottam TW, Dinh-Xaun AT, et al. Inhaled nitric oxide as a cause of selective pulmonary vasodilatation in pulmonary hypertension. Lancet1991;338:1173–4. Ivy DD, Kinsella JP, Wolfe RR, et al. Atrial natriuretic peptide and nitric oxide in children with pulmonary hypertension after surgical repair of congenital heart disease. Am J Cardiol1996;77:102–5. Ivy DD, Parker D, Doran A, et al. Acute hemodynamic effects and home therapy using novel pulsed nasal nitric oxide delivery system in children and young adults with pulmonary hypertension. Am J Cardiol2003;92:886–90. Ivy DD, Griebel JL, Kinsella JP, et al. Acute hemodynamic effects of pulsed delivery of low flow nasal nitric oxide in children with pulmonary hypertension. J Pediatr1998;133:453–6. Berner M , Beghetti M, Spahr-Schopfer I, et al. Inhaled nitric oxide to test the vasodilator capacity of the pulmonary vascular bed in children with long-standing pulmonary hypertension and congenital heart disease. Am J Cardiol1996;77:532–5. Atz AM, Wessel DL. Inhaled nitric oxide in the neonate with cardiac disease. Semin Perinatol1997;21:441–55. Wessel DL, Adatia I, Giglia TM, et al. Use of inhaled nitric oxide and acetylcholine in the evaluation of pulmonary hypertension and endothelial function after cardiopulmonary bypass. Circulation1993;88:2128–38. Channick RN, Newhart JW, Johnson FW, et al. Pulsed delivery of inhaled nitric oxide to patients with primary pulmonary hypertension: an ambulatory delivery system and initial clinical tests. Chest1996;109:1545–9. Katayama Y , Higenbottam TW, Cremona G, et al. Minimizing the inhaled dose of NO with breath-by-breath delivery of spikes of concentrated gas. Circulation1998;98:2429–32. Atz AM, Adatia I, Wessel DL. Rebound pulmonary hypertension after inhalation of nitric oxide. Ann Thorac Surg1996;62:1759–64. Pearl JM, Nelson DP, Raake JL, et al. Inhaled nitric oxide increases endothelin-1 levels: a potential cause of rebound pulmonary hypertension. Crit Care Med2002;30:89–93. Ivy DD, Kinsella JP, Ziegler JW, et al. Dipyridamole attenuates rebound pulmonary hypertension after inhaled nitric oxide withdrawal in postoperative congenital heart disease. J Thorac Cardiovasc Surg1998;115:875–82. Atz AM, Wessel DL. Sildenafil ameliorates effects of inhaled nitric oxide withdrawal. Anesthesiology1999;91:307–310. Tuder RM, Cool CD, Geraci MW, et al. Prostacyclin synthase expression is decreased in lungs from patients with severe pulmonary hypertension. Am J Respir Crit Care Med1999;159:1925–32. Sitbon O , Humbert M, Nunes H, et al. Long-term intravenous epoprostenol infusion in primary pulmonary hypertension: prognostic factors and survival. J Am Coll Cardiol2002;40:780–8. Rosenzweig EB, Kerstein D, Barst RJ. 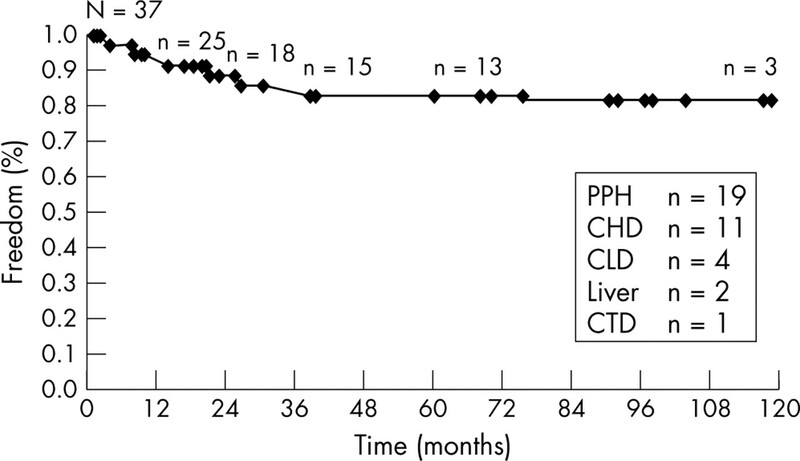 Long-term prostacyclin for pulmonary hypertension with associated congenital heart defects. Circulation1999;99:1858–65. Simonneau G , Barst RJ, Galie N, et al. Continuous subcutaneous infusion of treprostinil, a prostacyclin analogue, in patients with pulmonary arterial hypertension: a double-blind randomized, placebo-controlled trial. Am J Respir Crit Care Med2002;165:800–4. Olschewski H , Simonneau G, Galie N, et al. Inhaled iloprost for severe pulmonary hypertension. N Engl J Med2002;347:322–9. Max M , Rossaint R. Inhaled prostacyclin in the treatment of pulmonary hypertension. Eur J Pediatr1999;158 (suppl 1) :S23–6. Dahlem P , van Aalderen WM, de Neef M, et al. Randomized controlled trial of aerosolized prostacyclin therapy in children with acute lung injury. Crit Care Med2004;32:1055–60. Barst RJ, McGoon M, McLaughlin V, et al. Beraprost therapy for pulmonary arterial hypertension. J Am Coll Cardiol2003;41:2119–25. Barst RJ, Langleben D, Frost A, et al. Sitaxsentan therapy for pulmonary arterial hypertension. Am J Respir Crit Care Med2004;169:441–7. Schulze-Neick ILJ, Reader JA, Shekerdemian L, et al. The endothelin antagonist BQ123 reduces pulmonary vascular resistance after surgical intervention for congenital heart disease. J Thorac Cardiovasc Surg2002;124:435–41. Prendergast B , Newby DE, Wilson LE, et al. Early therapeutic experience with the endothelin antagonist BQ-123 in pulmonary hypertension after congenital heart surgery. Heart1999;82:505–8. Ivy DD, Doran A, Claussen L, et al. Weaning and discontinuation of epoprostenol in children with idiopathic pulmonary arterial hypertension receiving concomitant bosentan. Am J Cardiol2004;93:943–6. Michelakis E , Tymchak W, Lien D, et al. Oral sildenafil is an effective and specific pulmonary vasodilator in patients with pulmonary arterial hypertension: comparison with inhaled nitric oxide. Circulation2002;105:2398–403. Schulze-Neick I , Hartenstein P, Li J, et al. Intravenous sildenafil is a potent pulmonary vasodilator in children with congenital heart disease. Circulation2003;108 (suppl 1) :II167–73. Atz AM, Lefler AK, Fairbrother DL, et al. Sildenafil augments the effect of inhaled nitric oxide for postoperative pulmonary hypertensive crisis. J Thorac Cardiovasc Surg2002;124:628–9. Ghofrani HA, Wiedemann R, Rose F, et al. Sildenafil for treatment of lung fibrosis and pulmonary hypertension: a randomised controlled trial. Lancet2002;360:895–900. Sandoval J , Gaspar J, Pulido T, et al. Graded balloon dilation atrial septostomy in severe primary pulmonary hypertension. A therapeutic alternative for patients nonresponsive to vasodilator treatment. J Am Coll Cardiol1998;32:297–304. Boucek MM, Edwards LB, Keck BM, et al. The Registry of the International Society for Heart and Lung Transplantation: Sixth Official Pediatric Report, 2003. J Heart Lung Transplant2003;22:636–52. Gaynor JW, Bridges ND, Clark BJ, et al. Update on lung transplantation in children. Curr Opin Pediatr1998;10:256–61. Clabby ML, Canter CE, Moller JH, et al. Hemodynamic data and survival in children with pulmonary hypertension. J Am Coll Cardiol1997;30:554–60.